Professor Ohashi belongs to the Environmental Protection Engineering research lab, and his area of expertise is environmental engineering, which investigates solutions to environmental issues and looks for methods to preserve and regenerate the environment. 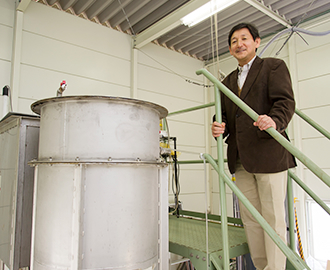 Professor Ohashi’s research is centered on the development of ultra-low cost energy-saving sewage treatment systems that can be used in developing nations. The mainstream method used in sewage treatment systems in advanced nations is the activated sludge process, which uses the functions of aerobic microorganisms to create extremely high-quality water. However, even when introduced to developing nations, this method is not widely used, as the costs and energy needs are high and maintenance is essential. For these reasons, developing nations require low-cost, energy-saving sewage treatment systems that suit those countries. 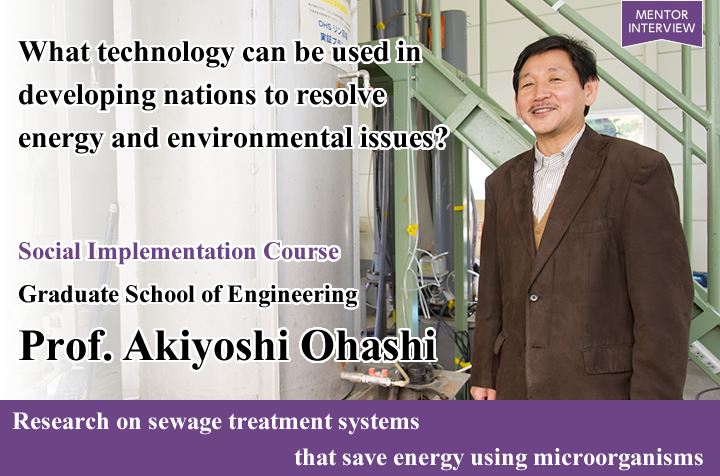 From this viewpoint, for the past twenty years, Professor Ohashi has been devoted to research on the development of sewage treatment systems that are closely aligned with the various regions in developing nations. 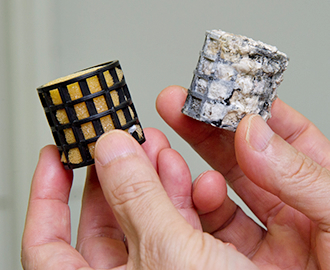 Currently, Professor Ohashi has succeeded in developing a sewage treatment system that links the UASB process (anaerobic treatment technology) with the aerobic DHS reactor as the after-treatment process (DHS refers to the new aerobic treatment method that uses a sponge as the organism hold-back carrier). 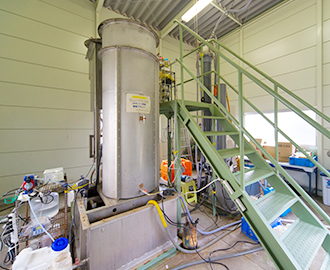 The UASB process is low-cost, creates energy and has easy maintenance, and by combining it with an after-treatment process that makes up for its shortfalls and improves treated water quality, it has been proven that this system produces no excess sludge, and creates treated water of the same level as the activated sludge process. “This system has been highly evaluated by the government of India. We built a large-scale plant in Karnal City and continued testing for its practical application for around ten years, and as a result the world’s first actual plant using the UASB-DHS sewage treatment system is being built in Agra”, says Professor Ohashi. Since that time, aiming for further quality improvements to the system, he has continued with research aiming to establish new environmental technology, such as technology that would prevent the diffusion of greenhouse gases from treated water, and the recycling of effluent and cultivation of new microorganisms. 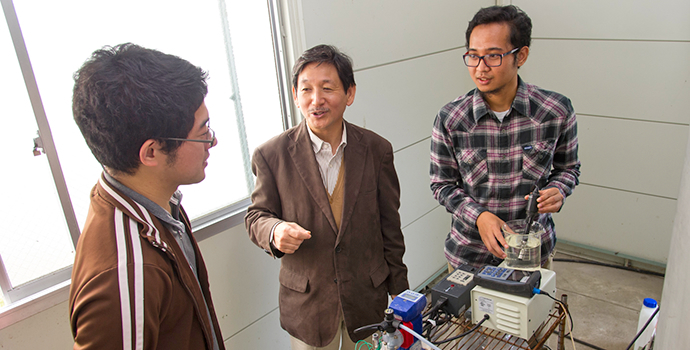 In the Taoyaka Program, Professor Ohashi teaches a subject called Advanced Environmental Protection Engineering. This is a class for civil engineers, where the students can learn about thermodynamics, which is essential for understanding environmental and energy problems, as well as the relationship between thermodynamics and the environment. “In this subject I use lectures and practical exercises, and I want the students to learn the basics of environmental issues and energy problems that they will be dealing with in the Taoyaka Program. There may be some areas that are difficult for the humanities students, but I think that it is important to know the basics in order to be able to see things. You can approach an issue if you know the basics” he says. Professor Ohashi also says that in the on-campus educational program, as part of learning those basics, the students will need to know about the situation in the respective countries they will visit. “As is the case with my own research, when thinking about technology development for developing nations, it must be technology that will be accepted by such nations. I need to go about my research based on knowledge of what such people are thinking, what they want. In the same way, those are the things that I want the students to know as preparation for their onsite work”, he says. Professor Ohashi says that based on his experience to date, he has keenly felt that people in any country have many demands, and that he wants his students to listen to what they have to say. Professor Ohashi also has the position of sub supervisor in the Taoyaka Program, and says that he is focusing his efforts on ensuring that the program runs smoothly and effectively. “I actually have around twenty years of onsite experience in developing nations, so I want to make use of that experience to provide guidance and support. Currently I don’t have any students who I am directly supervising, but at some stage I would like to have some students researching and surveying developing nations such as India or Indonesia”. In actual fact, although Professor Ohashi says that he has not fully formulated his thoughts about the Taoyaka Program, he did provide the following words of encouragement for the students. “I really want to tell them to ‘just go!’ Rather than it coming from me, there are things that they will realize and perceive by going to a place where the environment is bad. I think that they can gain a lot from that”. 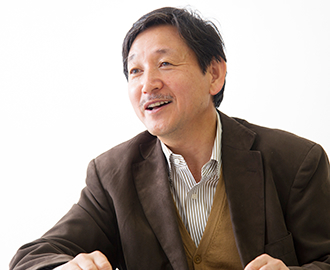 According to Professor Ohashi, the starting point for thinking about environmental issues is ‘realization’. “You can’t put countermeasures in place if you don’t know what the problem is, can you? Actually when I ask during the lectures on campus, I find that there are quite a few students who do not know. So it is important to perceive things. And to do so, basic knowledge is required. I want the students to get a solid grounding in the basics that will lead to realizations during their time onsite”. Another important thing is having aspirations, he adds.